I can sense the knives starting to come for me. How could I defend Henry? He obviously cheated Ireland out of the world cup. That he did. But the ongoing attacks on Henry have gone way way too far. In essence, Henry is being attacked for not being the moral saint of football. In my eyes he is really being crucified for the larger sins of football. Henry blatantly violated the rules, but when it comes to football all players, especially strikers, are “cheats” if you define it as trying to gain an advantage by flaunting the rules. The magnanimous English press declare he should have been the premier sportsman and admitted to the ref that it was a hand ball. That would have been an amazing level of sportsmanship and would have been applauded, but Henry is no Ghandi – nor should we expect players to be so. 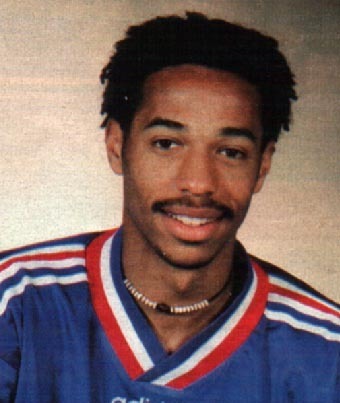 (I bet in retrospect a player like Henry who has played in three World Cups and won one of them definitely had more to lose from his reputation than from France not making the World Cup). Players aren’t angels and a moralistic libertarian approach toward governing the game is ridiculous. Yet the English have used this incident to attack Henry, the French, and to boast about British sportsmanship. But really the English have almost no leg to stand on in their attacks of Henry. First, imagine the shoe was on the other foot. England are in extra time of the second game of a two game playoff to go to the world cup and lets say Rooney were to have done what Henry did – instinctual control the ball with his hand. Would the Brits really have gone bananas calling Rooney a world class cheat. Many would have said the goal was bunk and shouldn’t have counted, many others would have been apologists for Rooney, but few would have thrown the kitchen sink at him. In fact, I would even say the apologetic French reaction, such as that from prominent figures like Emmanuel Petit, was more apologetic than the reaction that would have come from the Brits. Furthermore, from the US perspective, considering how international officiating has consistently gone against the US, I could probably mentally justify an Altidore handball that sent is through the world cup. The Brits I am sure would think the same. Second, the Brits are not as morally upstanding and pure as they like to think. The Premier league while lacking some of the diving and play acting so prevalent in Italy and Mexico America has many other traits that are definitely not sporting. With all the morally righteous British talk of Thierry Henry, United a very British team in ethic and composition, are actually poster childs’ of the new ethic in football. The scoffing that Henry should have gone and told the referee would never have happened in the Premier league and especially not by United. A team that has made it part of their strategic approach to a game to complain about every call and surround the official at every turn. Darren Fletcher has become the most egregious, if he picked the ball up with both hands and ran with it, he still would have complained at being called for hand ball. And the iconic British manager, Sir Alex Ferguson, was banned from the touchline for two matches for his aggressive attacks on officials. The Chelsea Manchester United game was one of the most petulant games I have witnessed in a long time – with British players on both sides – John Terry, Ashley Cole, Lampard, Darren Fletcher, Wayne Rooney, Ferdinand, Johnny Evans. While mellowing a bit, the great icon of English passion on the field, John Terry, was a petulant whiner who at every turn would lambaste the official. Now that said, this is not to pass moral judgment only that in the mind of the Brits, vehemently complaining about a referee’s decision even when there is no doubt to the call is not seen as unsporting or a violation of the “ethic” of the game. Americans tend to view the consistent surrounding and intimidating of the referee with disdain – a frequent cry among Americans watching the game is why doesn’t the ref give all those players yellows. And a poll of American fans would likely see us say that refs are way too lenient on complaining players. But one thing is for sure, the British have done quite a bit to contribute to the loss of footballs’ purity. The money and exposure brought about by the English Premier league, and the intense emphasis on winning, has been a prime factor in the erosion of whatever “moral” underpinnings defined the game. So when the British press moan about yesteryear and the moral fortitude of former amateur players, remind them that it was the Brits who helped cause it. This is no reason to shed a tear. Professional sports and international team competitions are great, and part of the reason they are great is that there is a lot on the line. Instead, of believing in some libertarian moral code, a game needs enforcers, it needs policing and this game needs replay on goal line decisions. Libertarianism is bunk, soccer needs big brother. He may not be satan, but that mustache is.